Thy Art Is Murder furiously charges once more unto the breach, clawing and spitting against the dying light and a seemingly inevitable collapse of existence. Dear Desolation, the Australian metal crew’s fourth and mightiest album, is a devastating blow equally against and embracing of a cataclysmic nihilism and all-out misanthropic warfare. Combining classic and authentic death metal elements that invoke the renegade, spirit-crushing, monstrosity of early Morbid Angel, Cannibal Corpse, and Decapitated with the precision rhythmic assault of Meshuggah and the breakdown-infused bounce of Black Dahlia Murder, THY ART IS MURDER have redefined a once cast aside and maligned subgenre, proudly reenergizing and representing the best in extremity. The band’s music remains uncompromising, building upon the savage momentum of the controversially outspoken Holy War (2015), the punishing Hate (2012) and their gigantic debut, The Adversary (2010). Dear Desolation continues the band’s evolutionary trajectory, remaining consistently inventive and diverse without sacrifice the band’s established identity. The adventurous spirit of the band’s unprecedented collaboration with The Acacia Strain and Fit For An Autopsy, released as The Depression Sessions, continues unabated, expanding and informing the band’s already confident creativity. Come 19th January 2018, they will be touring Singapore for the very first time! 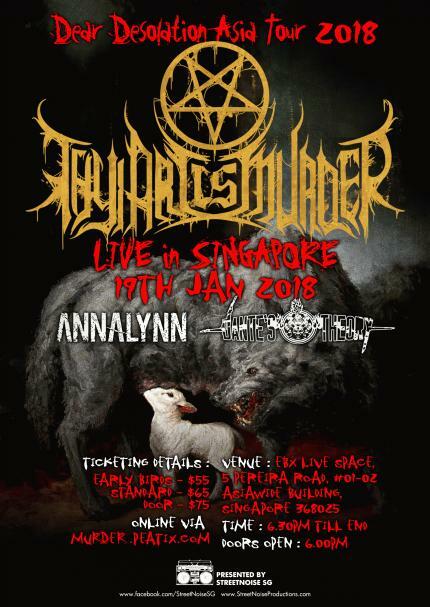 With special guest ANNALYNN from Bangkok Thailand and our very own boys Dante's Theory opening for Thy Art Is Murder! *HOW TO GET THERE* --- From Tai Seng MRT Station, go to Exit A. Then simply take a 5 minutes walk towards venue.